Style influencer Siphokazi Veti gives us advice on how to style your favourite denim pieces for a look that’s winter fresh. Denim for winter? How original, you may be thinking. 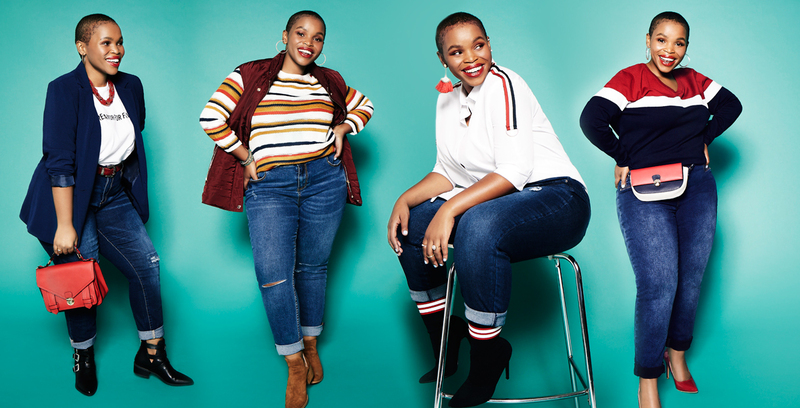 But when style and body-positive activist and influencer Siphokazi Veti lets you in on her best styling tips, you’ll be rethinking your denim strategy for the new season. A pair of jeans and a sweater is an easy go-to look for winter, but it can get boring day after day. Add the trendy moon bag to your ensemble for an instant update. Finish off with a pair of heels, and voila, your look strikes the perfect balance of sophisticated and cool. Denim and a white T-shirt is a fashion staple so classic no wardrobe should be without it. Take the timeless appeal of this look and throw some stripes into the mix for a modern upgrade. A stripe down the side of the shirt is understated and cool. Add a pair of statement boots and you’re good to go! Layering is an art. It can be tricky to get it just right, but it's essential for trans-seasonal dressing. Start with the base layers, which need to be the thinnest, and then pile on according to thickness. To get the balance right and avoid looking too bulky and sloppy, make sure you mix tight with loose. Go for tight-fitting jeans and a comfy pair of ankle boots to complete the look. For casual days at the office, pair a blazer with your statement T-shirt and jeans. It’s versatile, timeless and effortlessly chic. Add buckle-up boots and colour popping accessories to bring your relaxed but stylish look together. To learn more about Siphokazi and what she stands for, click here or follow her on Instagram at @siphokaziveti. Fashion direction & production: Brittany Penebre. Photography: Katinka Bester/Hero Creative. Styling: Rushana Burton. Hair & make-up: Shahnaz Cola-Wrensch/SNCM. Talent: Siphokazi Veti.